The eastern Dakota (Sioux) of Minnesota traditionally built "cunkaské" (pronounced choonkashkay)—wooden palisades, piles of stones and earthen entrenchments—around their camps and villages for protection against elements, wild animals, and potential enemies. One group was even referred to as the "Cunkaskétonwan," Nation of the Forts. In the summer of 1862, many Dakota openly rebelled against the intolerable treatment they had received from American authorities. As a result, several hundred Dakota refugees moved north to the relative safety of the Red River Settlement. In the spring of 1864, following an attack by Chippewa (Anishinabe) bounty hunters from Minnesota, the Dakota constructed fortified camps in the Portage la Prairie district. Each camp was enclosed by a circular trench and embankment behind which armed defenders could position themselves. Inside this circle was a ring of pits where the women and children could take refuge in the event of an attack. 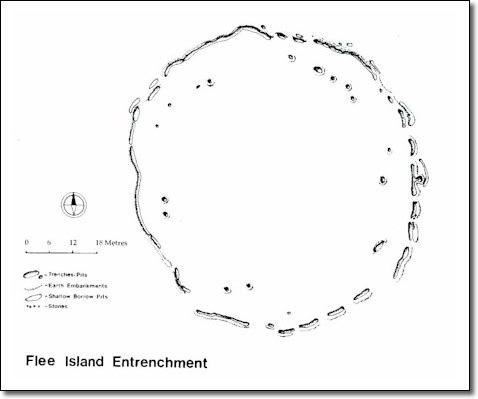 The Flee Island Entrenchment is nearly circular with a diameter of 73 metres. It is not quite continuous, however, as the eastern portion has been incorporated into the adjacent field. Depth of the intact trench varies from 0.3 to 1.0 metres, and there was a semi-continuous bank of earth on the outside. A number of deep, circular pits are also located on the inside, close to the trench.